DISCLAIMER: See cover for details. If you ask me for a benefit of blogging, I'd say working on collaborative projects like this. 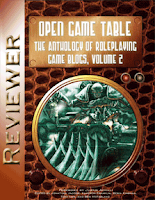 Open Game Table is an anthology of blog posts voted for and reviewed by peers - a collection of fine RPG blogosphere items. If you're starting out on blogging about RPGs and want to see how good it can get or feeling your fires burning low, take a look in here. What you'll find are some stunning insights into how to make games fun, a sentiment echoed by the foreword, written by Justin Achilli. If you get an opportunity to work on something like this, take it with both hands and run. Not only do you contribute, you learn in doing. Peer reviewing posts makes you apply that scrutiny to your stuff and (hopefully!) makes you a better blogger. Hats off to Jonathan Jacobs for the heroic work put into making it happen. The cynical may ask "OK, why would I buy this? I can just access the blog feeds right?" Here's the thing - blogs are sometimes more fragile than books. Posts vanish, authors hang up their shingle and the Wayback Machine isn't perfect. Having seen blogs on my feed join the blogosphere invisibule (to mangle a Parrot Joke reference), owning a copy means you can come back to stuff even if the worst happens. And if it doesn't, you're not trawling Google Reader for nuggets - you can just turn the page or if you've got a PDF, use the search facility. Also, each article has a web address to the article so you can see it (and the comments that follow) before editing. Now that is a web enhancement and shows the craft of the editorial team in action. The visual feel is reminiscent of Flying Buffalo's classic Grimtooth series, the cover art may appear steampunk but don't be fooled, there is something for everyone in here, from the hoariest grognard to the indie designer to the new arrival looking to expand their horizons. The contributions are diverse stuff, from interviews with Dave Arneson, Robin Laws and Jonathan Roberts through campaign design and play style to encouraging new players and gaming with children. The section on 4E is a worthy successor to the D&D Players Strategy Guide and has the added bonus of new monsters and an NPC. Even the humorous articles have elements of how to make a better game sown in them. In short, buy if you want a lot of good content - and if you're buying in PDF and don't own volume 1, take a look at this bundle. Woohoo! Thanks for the mad props! 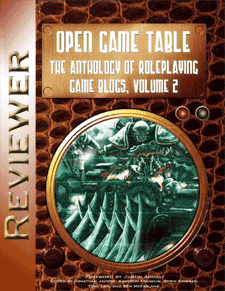 I would say the biggest benefit of Open Game Table is becuase there are something 1200 articles published in the RPG blogosphere EVERY MONTH -- who the hell has time to read them all? What i loved about putting OGT together was the that community nominated, selected, scored, and reviewed all 398 nominated posts - not me. I just brought everyone virtually together to make it happen. I mean.. I'm just some guy living in his mom's basement; what the hell do I know? There was a rub on REDDIT's rpg group about Open Game Table being something where you pay to get something that is otherwise available for free. I was like "Well... technically yes." And then the response was: why not just post a linked list of the TOC on your blog? I think they missed the point. OGT's audience is not blogoholics who live online; it was intended to bring non-blog readers who love RPGs to discover the blogs that rock, without leaving the hobby store... or something like that. thanks for all your hard work Satyre. I'm mailing out the comp copies this week (see the pic of my son helping me pack on the OGT Facebook fan page). If there's a Volume 3 ever -- I'll be sure to come calling again to get your help. What the Reddit query may not have glommed is that the posts were edited (integrating some of the better comments) so the TOC would show raw posts - not the finished text in some cases. I'll give you credit where it's due, what you pulled off getting this together was no mean feat and leading a project of this nature can - will be looking forward to the potential vol 3!